we wish you a prosperous 2013! 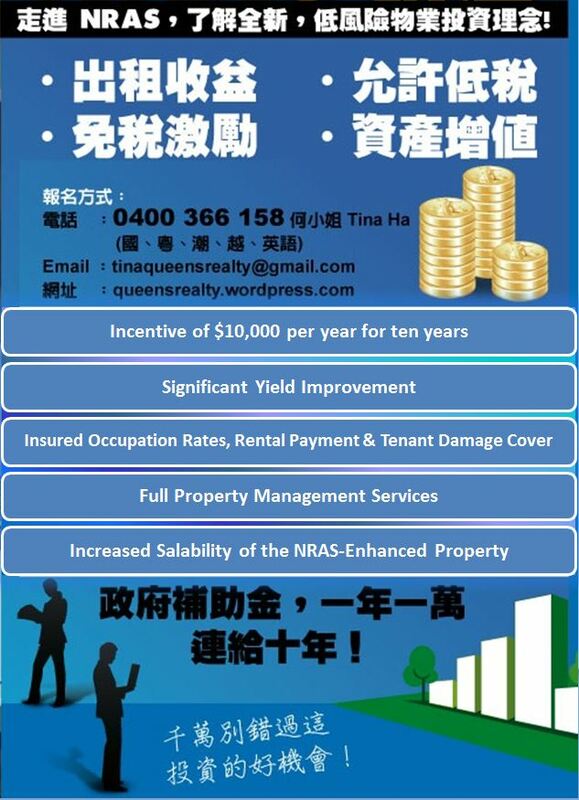 Contact Queen’s Realty on 0400 366 158 to invest in quality Commercial, Business or Residential Property. Unlike high-risk investment advisors, Queen’s Realty focuses exclusively on quality property investment opportunities that will position you well for a comfortable and safe lifestyle in a growing Australian state. 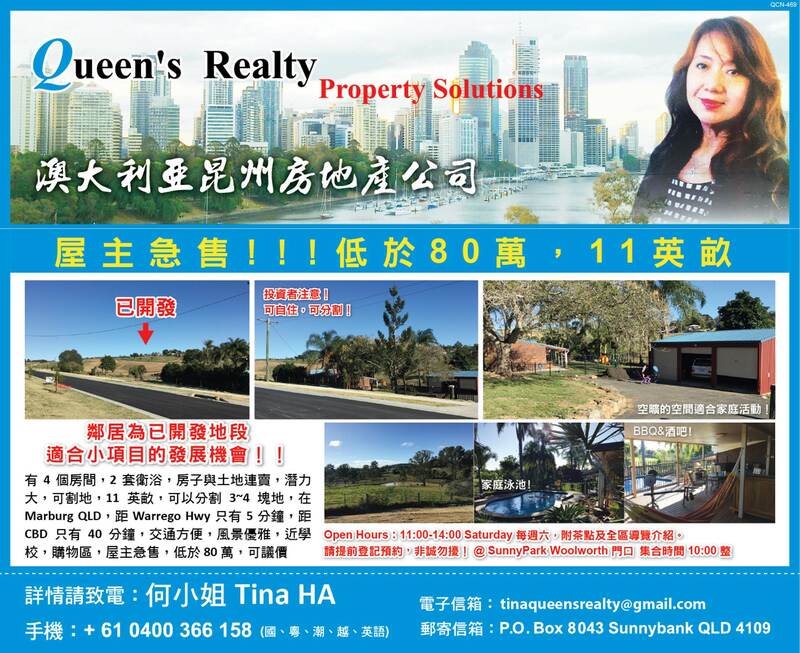 Overall, Queen’s Realty is a Brisbane-based real estate agent offering Commercial, Business and Residential Property Solutions. 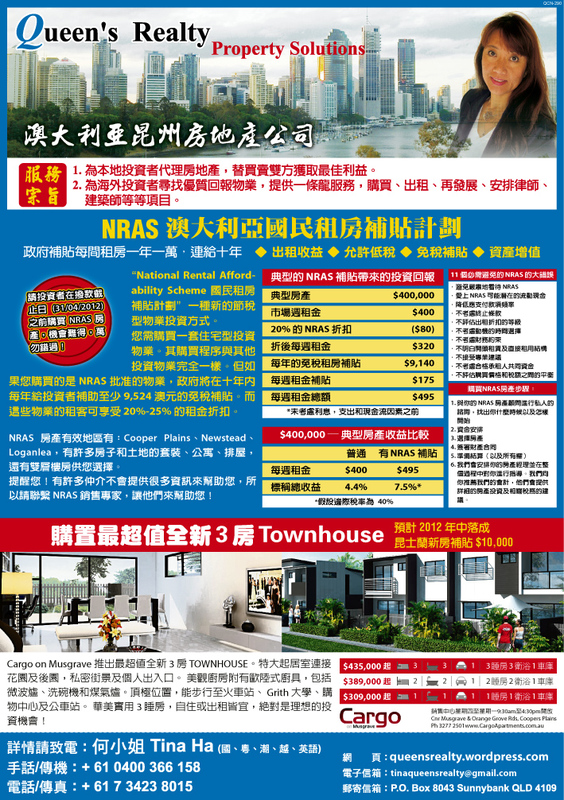 To act as a real estate agent for local investors in the best interest of both buyers and sellers. 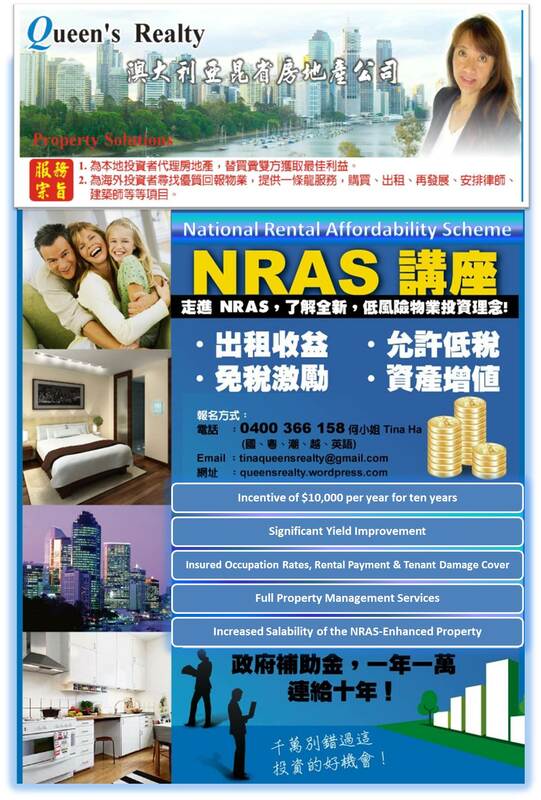 To assist overseas investors wishing to invest in Queensland business, commercial and residential properties via purchasing, renting or redeveloping property, and via arrangements with lawyers, architects, construction engineers, project managers and/or other parties. Our personalised, multilingual service and network ensure that clients are given ongoing assistance and support to achieve their goals. 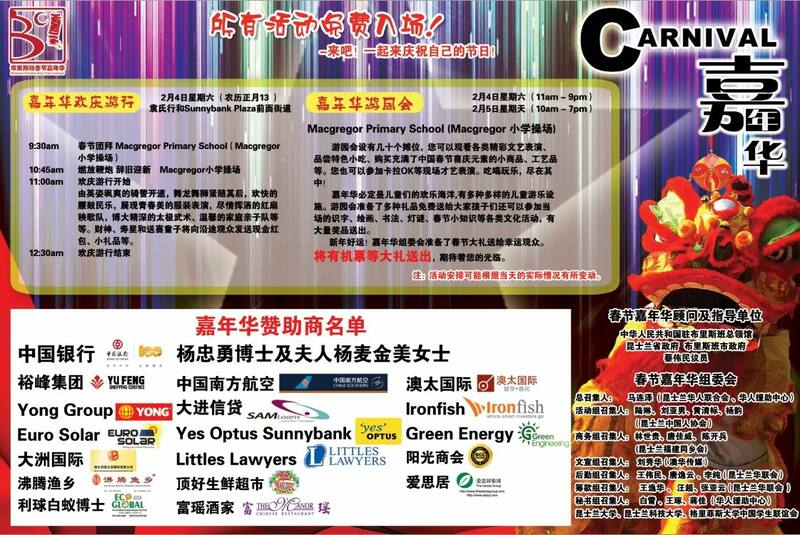 Languages spoken include English 英語, Mandarin 國語(普通話), Cantonese 廣東話, Vietnamese 越南話, and Chaozhou (Teochew) 潮州話. 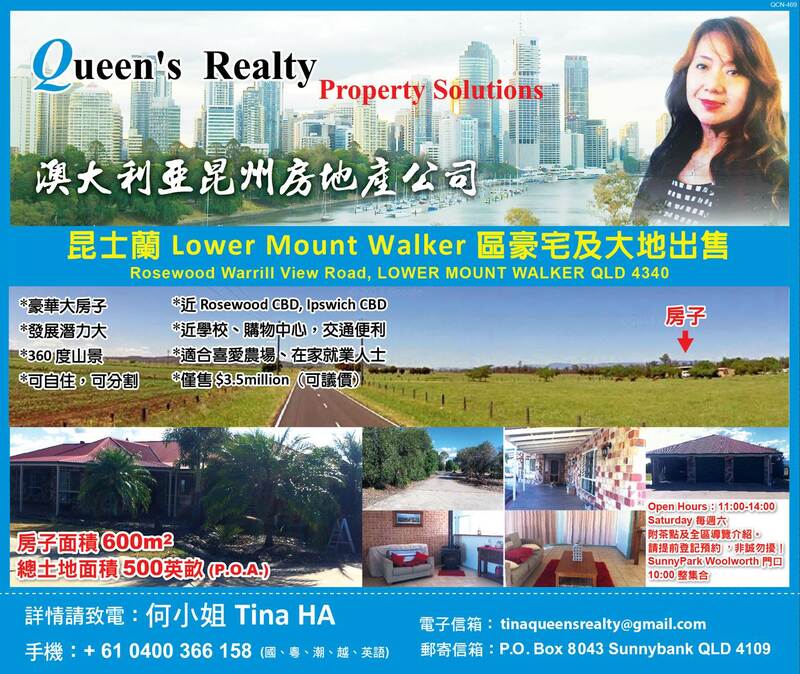 Having immigrated to Australia in 1980 and served in a variety of industries, Queen’s Realty‘s host Ms Tina Ha has wide connections. She is honest, sincere, hospitable and dedicated towards clients and friends to achieve the best results in work delegated or commissioned. Ms Tina Ha is customer-oriented, cordial and fluent in Mandarin, Cantonese, Vietnamese, Chaozhou and English. Click on the images below to visit Queen’s Realty‘s websites.